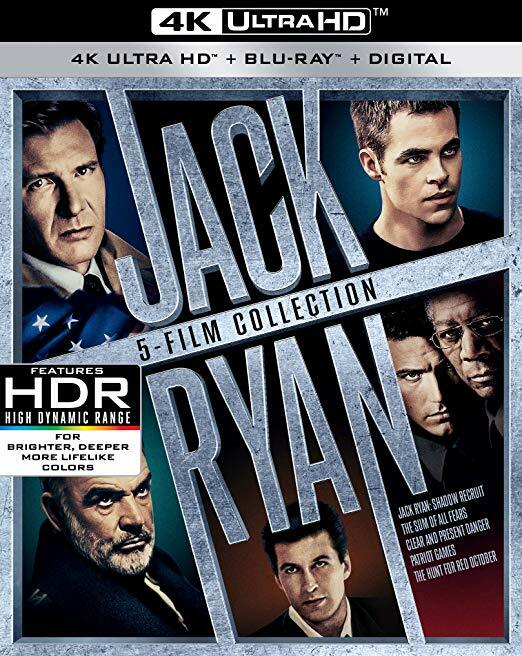 The fact that there is an upcoming Jack Ryan Amazon series, premiering on August 31, makes a perfect time for Paramount to release the feature films – all five of them – on 4k. The films arrived over a 24-year span, beginning in 1990 with The Hunt for Red October, followed in 1992 with Patriot Games, 1994 with Clear and Present Danger, 2002 with The Sum of All Fears and finally in 2014 with Jack Ryan: Shadow Recruit. The final title sound like a video game. The leads have ranged from Sean Connery to Harrison Ford, Ben Affleck and Chris Pine, and always with superb supporting players. Directors, John McTiernan, Phillip Noyce (2 & 3), Phil Alden Robinson, and Kenneth Branagh, who also appeared. While all were shot on film, the final installment was finished as a 2k DI. Whether negative was cut, and the studio returned to film for the 4k is questionable, but all look superb. The first four are tack sharp, with a gorgeous river of grain, and beautifully rendered shadow detail and black levels. Pricing couldn’t be more fair. Currently $70 for the five films. For those without an abacus, that works out to $14 a film for true (back to film) 4k. A bargain for five superb thrillers. I will need to cross the border for this one. No Canadian release yet. Bummer. I find I'm enjoying more 4K from film then I am from 4K DI releases. It's more fun watching through a layer of grain. The grain is a faint curtain at screen level yet there is depth that goes deep right behind it. Warmth. It's like archaeology…seeing into the past as clearly as possible. While Sean Connery is certainly the lead in The Hunt for Red October, it would be unfair not to mention Alec Baldwin who played the Jack Ryan character in that first film version. Yes, it seems like the guy who played the ostensible main character should be named, but Connery really does play the "lead". Ryan takes a definite backseat to Ramius! Hunt is the only one I’m interested in. I’ll wait for a single release. By the way the kindle version of The Hunt For Red October is on sale today for $1.99. I picked up a copy yesterday…..Thursday…..at the local Best Buy here…way out in NL!!! The BB web site did not show store stock for this item. It was "only" CAN$69.99…not bad as Amazon.com shows US$69.99. My favorites are the two Ford films, but I enjoyed them all except Sum of All Fears (never been a fan of Affleck). "C&PD" is probably my favorite, but I've never much cared for "Patriot Games". If anybody is interested, iTunes is selling this 5-Movie Collection for $29.99 and all titles are 4K/UHD. Thanks, Robert. I was considering just buying The Hunt For Red October on UHD disc when these eventually were released individually, but at $6 per film I just bit on the iTunes deal. I have never seen The Sum of All Fears (but did read the book) or Shadow Recruit. I only owned THFRO on DVD, and did not have any of the other films in my collection at all. I'm not a big Affleck fan, but I'll give him a chance. I've been reading the Tom Clancy books. Hunt is the only movie that does justice to the source material. I did not like what was done with Clear and Present Danger, and from what I've read, I wouldn't like Patriot Games either. I won't ever bother to watch even a few seconds of Sum of All Fears. The changes to that one (done out of political correctness) are truly execrable. I won't ever bother to watch even a few seconds of Sum of All Fears. The changes to that one (done out of political correctness) are truly execrable. I don’t think the changes work well, but you are wrong on why the change was made. It wasn’t out of ‘political correctness’. That’s nonsense. Director Phil Alden Robinson is on record saying the change, which was made before the September 11 attacks, was made because it didn’t seem plausible (to him) for Arab terrorists to pull off the sophisticated attack as written in the book. Which would be a testament to his naivete rooted in his desire to be PC. No the "horsebleep" (I'm not stooping to your level) is that anyone with an IQ above a single digit following the first WTC bombing and every other notable terrorist attack going over the course of decades would somehow think Arabs weren't capable of being "sophisticated" to do something very heinous. Well he, and a sizable group of the intelligence community, were wrong, but that doesn’t mean he was making the changes to be ‘PC’ – that’s something a certain group of people like to sum things up to when they don’t like it. Which hardly would account for why this industry has in general had a bigger aversion to showing "sophisticated' Arab terrorists even *after* 9/11. None of which is relevant to the choices made for The Sum of all Fears. But plenty relevant in judging whether there's an instinctive PC mentality in the industry. And FYI, Buster, I nearly lost a family member in the North Tower on 9/11, so I don't need a lecture on what is and isn't "horsebleep" regarding someone's refusal to recognize the world as it really was before and after that date. Just saw that you added this. You aren’t the only one with personal connection to the tragedy that day, so I’m not sure what difference it was supposed to make here. And if you think you are being lectured – and not disagreed with – you might want to read the posts again. Oh please. Anyone who stoops to a cheap one word vulgarity for a response isn't engaging in mere "disagreeing". THAT is real "horsebleep." And we'll end this back-and-forth here and now fellas. You've each said your piece and we're going to move on and continue with our discussion of the subject at hand. We each know where you two stand on the particular aspect of Sum of All Fears and other ancillary points. But that conversation is being called to a close so that other aspects of this release may be discussed. You both know the rules. We don't talk AT each other and about the other's motivations. We keep discussions on topic and give our opinions. Let's back away and take a breath and keep that in mind. It's a known fact that CAIR contacted him and objected to the Arab terrorist plotline, and he kowtowed to them, so so I don't buy for a second that it's "nonsense". It's a known fact that CAIR contacted him and objected to the Arab terrorist plotline, and he kowtowed to them with a letter proclaiming his sensitivity to their viewpoint, so I don't buy for a second that it's "nonsense". That’s an inference you have drawn from CAIRS campaign, not from the stated positions of the director or writer. “Perhaps the largest change were the original terrorists. In the novel, they were Arab nationalists, but in the film, they were changed to neo-fascists. A common misconception is that this was done as a reaction to the September 11, 2001 attacks, but the movie finished filming in June 2001. As I said, I don’t think the changes work, but they were artistically incorrect choices, not fearful ones according to those who actually made the film and were there, in the rooms and meetings, on set and so on! "director Phil Alden Robinson settled on neo-Nazis, a perennial favorite, at which point he wrote the following in a letter to CAIR: "I hope you will be reassured that I have no intention of promoting negative images of Muslims or Arabs, and I wish you the best in your continuing efforts to combat discrimination." Ben Affleck, the new Jack Ryan, has applauded the decision, arguing that "the Arab terrorist thing has been done a million times in the movies." (As opposed to the neo-Nazi thing?) And the terror attacks only heightened concerns over ethnic insensitivity. In late September, Paramount chairman Sherry Lansing expressed sympathy for "these Afghan or Arab children in high schools who are getting picked on," suggesting that she'd steer clear of movies with Muslim villains." Those are known facts. There is no "inference" involved. It got a little heated in this thread so let's remain calm/cool and collected with our responses to each other. There is no reason for vulgarities to be used in our exchanges. We can do better than that. I see it as an inference. It is possible to make an artistic choice to change the original villains (for the reasons the director and writer stated) and also recognize the ‘value’ of that choice in not furthering negative images. I’ve seen Alden’s written response to CAIR, and may have said the very same thing irrespective of the original reason for the change. I’ll move on, but the exchange actually highlights the nuances of artistic decisions rather than the ‘kowtowingl for political correctness, but I don’t want to spend more energy on that battle here. So, once again, we’ve read the same thing and come away with different interpretations. That fits the definition of political correctness. Your own words contradict your previous characterization of my contention as "nonsense". Try as you might to have everyone believe that acting precisely in accordance with what CAIR demanded is sheer and utter coincidence, other people can see that it's not only looking like a duck, swimming like a duck, and quacking like a duck, it's yelling "I'm a duck!" Who wants a vacation? You've been warned twice, cut it. For those Canadians who were wondering if the 5 film collection is available, I also picked it up at Best Buy for $69.99 Canadian bucks. Great deal! They were in the back and not on the shelf and the Best Buy website wasn't up to date on it yet. I'm not sure if there was an intentional hold on it, but they gave it to me anyway! iTunes $29.99 4K/UHD bundle it is for me! I have a lot to view this week. I'm surprised you didn't call out how the exchange between Ritter/Clark in Clear and Present Danger echoes Allenby/Lawrence in Lawrence of Arabia. Clark: I want the money in my account before I move an inch. Clark: I need a Comsat link. Ritter: You can have a brigade. Lawrence: Two thousand small arms, not enough. I need five. Lawrence: Money. It'll have to be sovereigns. They don't like paper. Lawrence: Instructors for the Lewis guns. Lawrence: Twenty-five thousand now. A lot more later. Dryden: It can be done, sir. Lawrence: A couple of armored cars. Allenby: Right. I know to give you every blessed thing I can, Major Lawrence, because I know you'll use it. Congratulations and thank you. Watching the first one now. Bumped up backlight and contrast and now I can seem it. Got the set for a smidge under $40 from Amazon on Black Friday. Supposedly – not that Ive ever heard Mr. Clancy confirm anything to the effect, mind yu – the character of Jack Ryan was atleast semi-inspired by the military and intelligence (and eventual political) career of one George Herbert Walker Bush. Again, have never heard anything from the author confirming such a rumor, but have heard it many times through the years. If true, it would make sense. I can think of few real-life people whose career mirrors the charcter of Ryan so closely. Next Next post: ‘World’s First’ 8K from LG Definitely Here?